Thank you for that thought, Lindylou. I do try to bring out the beauty in the native plants around us. Someone with the name Schwartzman can appreciate your promotion of the native zwarte bij. A rich subject for photography. The little star is lovely. I see that the song became a hit in the U.K., so perhaps it made its way to New Zealand as well. Here’s the original recording. What a sparkling and delicate close-up! Looks like fairy dust! Thank you for showing off the beauty of this plant to its best advantage! You’re certainly welcome. May the fairy dust bode well for you. When the receptacle, i.e. the star, is freshly revealed, it has a sheen that easily catches the light, as it did here. I look forward to the latter stages of poverty weed each fall. With all the rain we had until recently, I thought I’d missed a good display this year, but then I began finding some of these bushes with maximum fluff still on them. If I were just passing by, I would never have realized that this relatively plain looking plant could be so beautiful. Poverty weed becomes special in the fall. At other times of the year you probably wouldn’t pay much attention to it, except in anticipation of what it will do in the fall. I always love the way sun shines through grass, and the poverty weed is a great example on a larger scale. I really enjoy your series with the close-ups to go with the photos of the subject from a distance. Photographers live for light (and the very word photography means ‘writing with light’). Poverty weed offers opportunities for translucence as light passes through fluff, and for reflection as light glances off the receptacle (the star). When I started these posts in 2011, I already had the notion of showing various stages of each species whenever possible. Of course there are hundreds of native species here, and I can’t possibly get a good picture of each one in each stage, but I do what I can. I used to assume any fluff landing in my varnish was milkweed. I know better now; goldenrod or poverty weed’s a more likely candidate, especially this time of year. 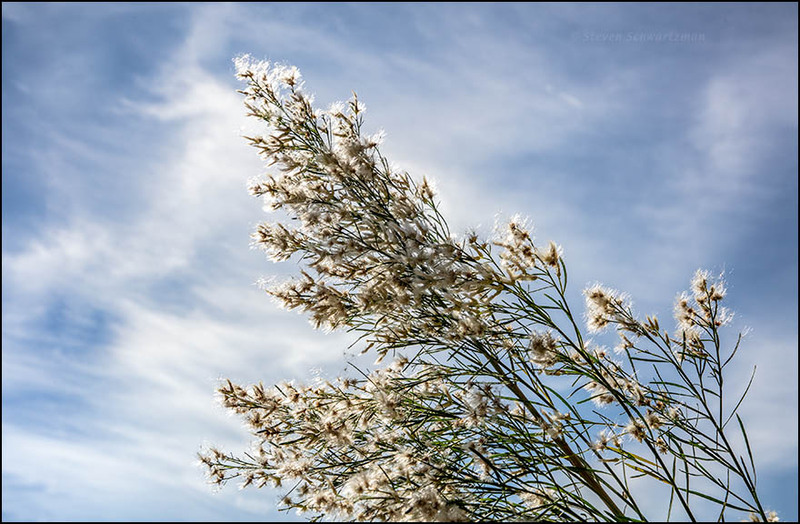 That’s a lovely arrangement of plant and cloud; there’s clearly enough wind to set great clouds of seeds a-flying. Live and learn, right? 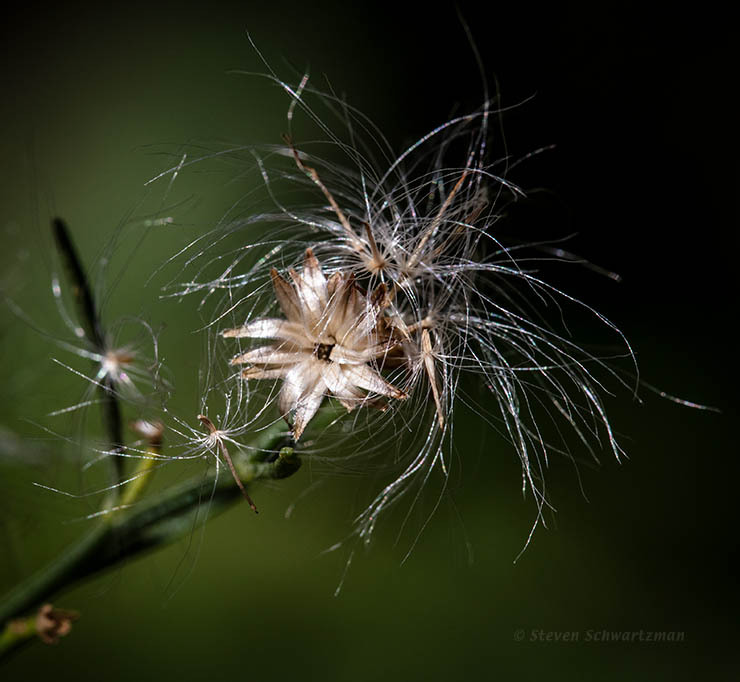 My impression is that much more fluff comes from poverty weed, goldenrod, and other plants in the sunflower family, than from milkweeds, especially, as you say, at this time of year. Near the poverty weed I found some of its seed-bearing fluff on other plants and took a few pictures showing the combination. Beautiful, both. That first one begs for haiku. Hm. Let me think on it. I’ll be waiting to see what you can come up with that conveys the sense of poverty weed fluff and wispy clouds. I was over at your blog when these comments came through. I like the way you played with royalty versus poverty. You’re right about dropping the “is” to get five syllables in the last line, but did you accidentally leave out four syllables of the seven you need in the middle line? I was over at your blog when your haiku came through. I like the way you played with royalty versus poverty, and the way crown can be taken in two senses: the top of a tree or the ring worn on the head of a royal. You’ve met your self-appointed challenge. Thanks. I enjoy juxtaposing a broad view with a close one. The little star is nice enough to use in dried arrangements. Because poverty weed is a star in my botanical firmament, I give it that treatment. I didn’t provide a sense of scale in the second photograph. The receptacles (stars) are actually pretty small, probably about a third of an inch across, so any dried arrangement including them would likely be a miniature one. Dang! Such unappealing names! Not only is it a baccharis, but it is neglecta! and poverty? and weed? wow. The funny thing is that is looks more interesting than our native baccharis because it is unfamiliar. I know not what course others may take, but as for me, give me poverty weed and I won’t neglect it. The common name goes back to the Great Depression, when this species readily sprang up on abandoned farms. People also called it Depression weed and Roosevelt weed. Well, it certainly sounds more appealing when you put it that way. . . . I mean that you would not neglect it. Right. There’s no way I’d neglect something so visually appealing. I did not get as far as Heavener, although I had looked at real estate there from here. If I had seen baccharis in Oklahoma, I would not have recognized it. Those in your articles are nothing like what I am familiar with. They were not blooming while I was there. If I had noticed it, I probably would have liked it, just because everything there was so unfamiliar, just like the Eastern red cedar that so many okies are not so keen on. I thought they were totally rad! From what you say, if you’d managed to have some time in Heavener, I suspect you’d have found the vegetation heavenly. Well, I find it as such without even being there! I really do not know what the allure of Oklahoma is, but . . . WOW! I really am a Californian, and I have no intention of ever living anywhere else, but I could SO vacation in Oklahoma! Gads! That’s it! This is the ‘unappealing’ native that grows throughout most of coastal California. I knew it mostly from Montara on the coast of San Mateo County, but it grows wild here and in the Santa Clara Valley . . . . and everywhere around here. There is a low growing ground cover type too, which is the ancestor to the cultivars that are available in nurseries. Although they are subspecies or varieties of the same species, we tend to distinguish them as Baccharis pilularis as the shrubby form, and Baccharis consanguinea as the ground cover form. I don’t know why we do it that way. Those that we use in landscaping are all male. As a nature photographer, I find it strange to landscape with male Baccharis plants because then there’s no pretty fluff in the fall. Maybe the people who tend the plants don’t want to have to clean up all that fluff, or maybe they don’t want new plants sprouting up nearby. The poverty weed in this post’s photos used to be bigger but whoever maintains that streetside strip trimmed the bush way back a couple of years ago. I worried that they might have killed it but fortunately it has hung on. The male clones are used because the plants are foliar only. I mean than they are just foliar ground covers with green leaves. The natives that bloom are scrubby, and hold onto their old dead stems. We happen to have a few at work that we intend to salvage for now, just to see how they work. They happened to come up in a landscape that is composed of garden varieties of native plants, so no one will notice. If we keep the dead pruned out, we will see how they look in bloom and behaving almost as they would in the wild.